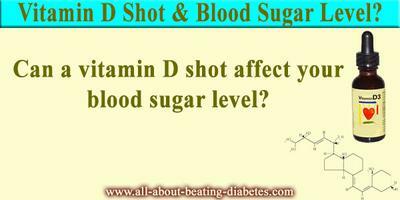 Vitamin D Shot & Blood Sugar Level? QUESTION: Can a vitamin D shot affect your blood sugar level? I’m very pleased that you are searching new ways to beat diabetes and I have to congratulate you for this. However, straight to the point: Vitamin D is proved to lower the blood glucose level in patients with diabetes. Besides this, it is proved, by the same study, that the Vitamin D reduces the symptoms of insulin resistance. 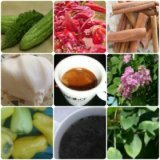 The only thing that does matter in here is that patients with diabetes, who are using Vitamin D, are minimizing the daily drug constantly, because of an improvement in their condition. The first one is that the exact mechanism of actions is still not discovered. The second thing is that, the possible side effects and drug interactions are not found. This means that vitamin D is still not proved to be safe in patients with diabetes. According to this, I have to warn you not to use the Vitamin D by yourself and to talk to your physician about its eventual usage. Just for your information, I will mention that there are several clinical trials regarding the effectiveness of Vitamin D and if you want to test its effectiveness, you can always participate in one of them. Other thing, which I want you to keep in mind, is that the Vitamin D is playing very important role in the calcium metabolism and if you are having problems with it, avoid its usage and talk to your doctor about this.